One thing I wish I had more guts to do is play with metal patinas. Except why bother when lovely shops like that of Miss Ficklemedia have it down pat? 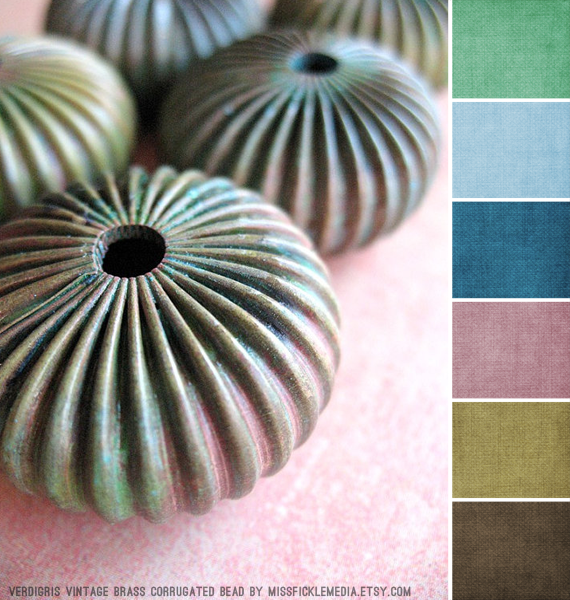 I'm totally smitten with the colors owner Shannon creates with patinas. I'm so used to thinking of color as coming only from beads, but Shannon clearly proves me wrong with handmade links, chains, and charms. 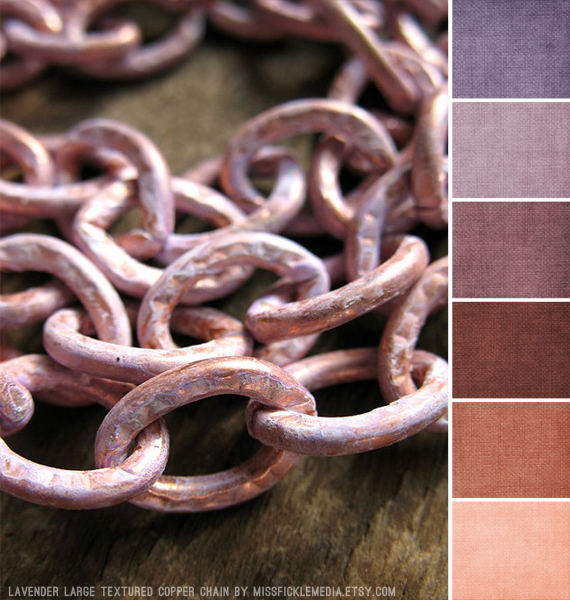 What a fantastic way to bring in pops of color to add to jewelry designs! 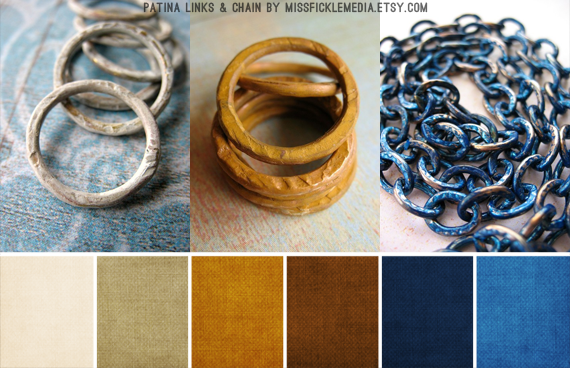 Tell me, have you played with patinas yourself? Or colored links? To see more from Shannon, you can visit her shop right here. Shannon's work is beautiful. I have her tutorial but have not gotten into it in depth. I need to grow another head and pair of hands before I tackle it:):) She's the master, though. Love, love those verdigris flowers and the patined chains. I've never played with it but I sure do love it!! You're right. There are so many that have got it down pat, I don't feel the need to get into it. Thanks for sharing! 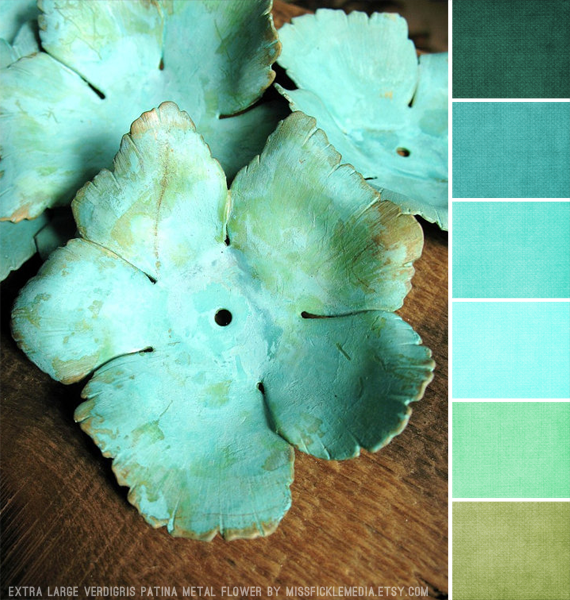 love, love, love all of the colors in these palettes. What website do you use to get those awesome color palettes? I am so in love with Shannon's beautiful color work on metal. These palette extractions are wonderful! How where they generated? Do you have an underlying template for the swatches or ? I'd love to play with this tool! Love those vintage brass beads! I got Shannon's Color Drenched metal tutorial and was inspired to get her patina kit as well - haven't had a chance to play with them yet...soon, soon. Shannon has been super helpful so far in my own patina journey. Thanks ladies! I'm glad you all enjoyed them. As for the color palettes, I make them myself. If you have Photoshop, I created palette template files over here: http://www.freshlyhued.com. I bought one of those flowers! And I love the palettes. 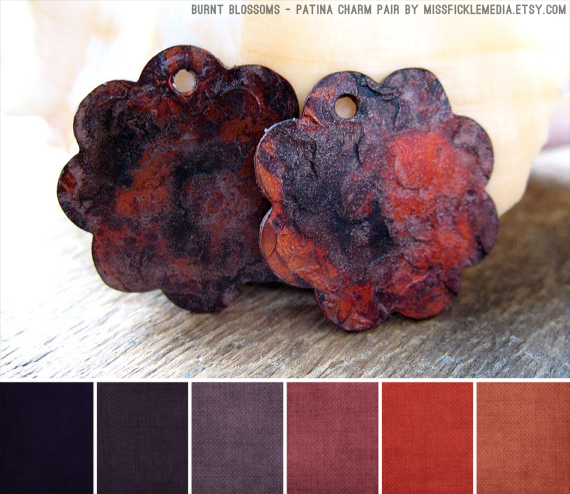 Beautiful palettes! I occasionally play with patinas but I've been much more focused on my ceramic beads lately than my metalsmithing. February Monthly Challenge Prizes and Sponsors!